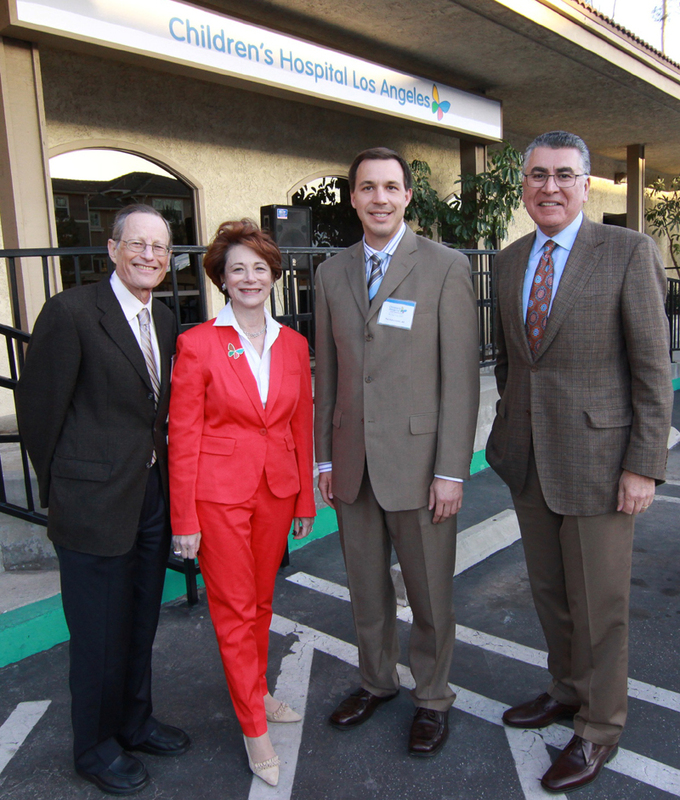 Celebrating the grand opening of Children’s Hospital Los Angeles — South Bay are: (l-r) Robert Adler, MD, MSEd; Cathy Siegel Weiss, Co-chair, Children’s Hospital Los Angeles Board of Trustees; Pediatric Urologist Paul Kokorowski, MD, of Manhattan Beach; and Richard D. Cordova, FACHE, president and CEO of Children’s Hospital Los Angeles. Presented with tributes of recognition and gratitude from South Bay civic leaders, Children’s Hospital Los Angeles recently celebrated the grand opening of its new outpatient center in Torrance with a ribbon-cutting ceremony attended by more than 50 hospital officials, community leaders and special guests. The hospital was presented with proclamations of recognition from the City of Torrance, the Torrance Area Chamber of Commerce and from the offices of Assembly member Al Muratsuchi and State Senators Ted W. Lieu and Rod Wright. Preceded by the hospital’s outpatient centers in Arcadia and Valencia, Children’s Hospital Los Angeles – South Bay is the third ambulatory care facility opened by Children’s Hospital since 2010. Earlier this year, the hospital also joined forces with Providence Tarzana Medical Center to jointly operate Providence Tarzana’s pediatric and pediatric intensive care units, where patients now have access to Children’s Hospital Los Angeles pediatric specialty services. “Children’s Hospital physicians have great relationships with many South Bay community pediatricians, who are pleased that their patients will now have convenient access to the hospital’s pediatric specialists,” says Paul Kokorowski, MD, of Manhattan Beach, a pediatric urologist who has office hours at Children’s Hospital Los Angeles – South Bay. Children’s Hospital – South Bay Outpatient Center is conveniently located at 3440 Torrance Blvd., Ste. 100, Torrance, CA 90503, just a block from the Del Amo Fashion Center. It is open from 8 a.m. to 5 p.m., Monday through Friday. The site is staffed by Board-Certified and Board-Eligible pediatric clinicians. Staff will also provide walk-in X-Ray services. Appointments can be made at 310-303-3890. For additional information go to CHLA.org/SouthBay. Children’s Hospital Los Angeles has been named the best children’s hospital in California and among the top five in the nation for clinical excellence with its selection to the prestigious U.S. News & World Report Honor Roll. Children’s Hospital is home to The Saban Research Institute, one of the largest and most productive pediatric research facilities in the United States. Children’s Hospital is also one of America’s premier teaching hospitals through its affiliation since 1932 with the Keck School of Medicine of the University of Southern California. For more information, visit CHLA.org.